"Serving as a platform to publish research that has in many cases itself been interrupted by the authors’ own forced migration, the journal aims to show the impact of the refugee crisis on academic scholarship and the lives of academic refugees. It also provides a forum for valuable incomplete research; often a fragment of an unfinished research project, such as a hypothesis or methodology, can contribute significantly to scholarly development." The journal will be Open Access. 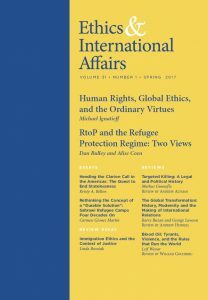 - Includes feature on "RtoP and the Refugee Protection Regime"; also includes essays on "Heeding the Clarion Call in the Americas: The Quest to End Statelessness" and "Rethinking the Concept of a 'Durable Solution': Sahrawi Refugee Camps Four Decades On" (latter article is free full-text). - Includes articles on immigrant health in the U.S. and immigrant integration. - Special issue on "The European Union and the Refugee ‘Crisis’: Inclusion, Challenges, and Responses." - Mix of articles, including "The Continuing Shame of Europe: Discourses on Migration Policy in Germany and the UK" and "Reduction or Deflection? The Effect of Asylum Policy on Interconnected Asylum Flows." Also includes article on teaching migration and refugee studies in the U.S.
- Theme is "Migrants/Habitants: Urbanités en Construction." - Special issue on "Refugees Welcome"; click on "index" for table of contents. - Symposium issue on "The Global Refugee Crisis." Includes 12 articles. - Virtual edition on immigration; 14 previously published articles in PoLAR are freely accessible until early June 2017. - Newsletter from the ABA International Refugee Law Committee. Includes several articles on the recent Executive Orders in the U.S.
- Focus is on the "refugee/migrant crisis" in Europe.